John Strayhorn was born and raised in the Strayhorn home five miles west of Florence. His father was well known across Texas and a sheriff for Williamson County. 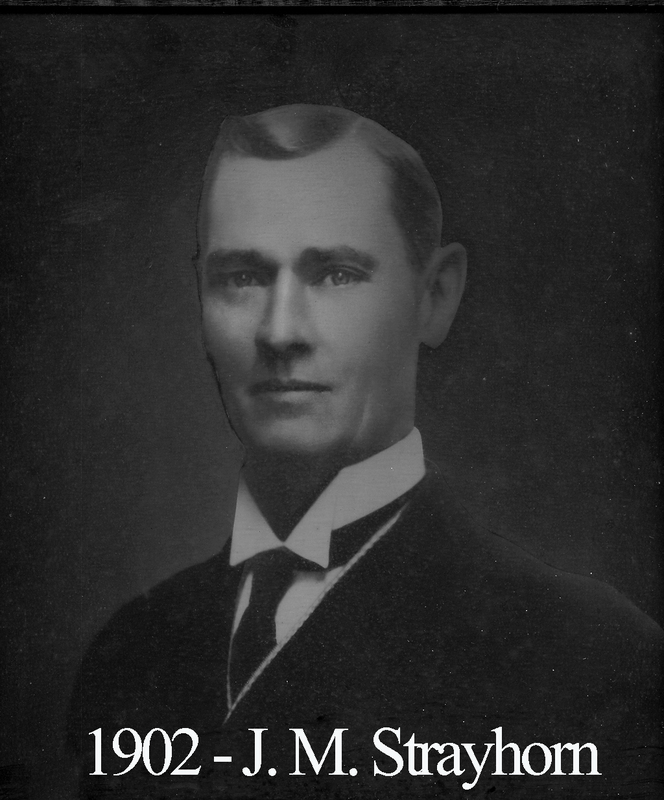 He studied at Texas Military Institute and was in the first class at Southwestern University in Georgetown before attending Medical School at the University of Tennessee in Nashville where he graduated in 1893. He interned at New York Polyclinic Hospital before returning to Texas where he practiced in Bartlett, Waco, and San Antonio. Strayhorn was the first mayor of Bartlett. He served as an army surgeon in the Spanish-American War. When he ascended the East at 92, it was 1901 and the lodge was described as being in “dying condition.” Strayhorn was said to be a “very earnest worker, full of zeal and adept in all the degree work.” These qualities would prove to be very important. He and a healthy group of others guided Waco 92’s turnaround. He was also a leader in completing the decades-long task of bringing the Grand Lodge from Houston to Waco. On June 27, 1901, the Grand Lodge(then still in Houston) visited Waco after being invited by Waco 92 to preside over the cornerstone ceremony for Mclennan County’s new courthouse. While Master of 92, Strayhorn operated as Master of Ceremonies at the cornerstone ceremony for the old Austin Avenue Methodist Church located at 12th and Austin. Also during his year in the East, Waco 92 offered $10,000 to win the Grand Lodge bidding for a new location. This endeavor proved to fully restore activity and interest at Waco 92 and sparked the greatest era in our lodge’s history, beginning with the Grand Lodge moving to its first location at 6th and Franklin. He died January 16, 1930.